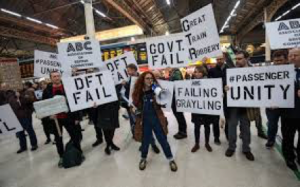 Since April 2016 the RMT, the railway guards’ union, has been struggling to hold the line against attempts by Southern Rail, subsidiary of Govia Thameslink (GTR), to universalise the practice of ‘driver only operation’ (DOO). Under this system, guards are stripped of all their operational responsibilities, including responsibility for seeing that all doors are safely shut before departure. The union argues that pressing on with DOO, by reducing the safety-critical role of the guard to that of a glorified ticket-seller (or ‘on board supervisor’), lowers the safety standards of the service as well as paving the way for further deskilling and redundancies. Workers in the rail industry are broadly organised in three different unions: the RMT (guards), ASLEF (drivers) and TSSA (clerical workers). Whilst on some issues (e.g. the campaign to renationalise the industry) the unions at least formally co-operate, this co-operation seldom if ever extends to coordinated industrial action, especially since the banning of sympathy strikes criminalised such co-ordination. As one would expect, management loses no opportunity to divide and rule, exploiting this lack of organisational unity. The DOO issue, however, affects drivers as much as it does guards, forcing drivers to shoulder increased safety-critical responsibilities and broadening their potential exposure to criminal prosecution should things go wrong. Drivers on DOO services are already complaining that they are expected to make a snap unilateral decision on closing the doors on the basis of skim-reading multiple CCTV images. That’s why ASLEF balloted its members for industrial action in April, beginning their campaign on the issue in the same month as their comrades in the RMT. However, when a court injunction forbade the drivers to strike, ASLEF meekly complied. The same happened in June and again in August, as successive ballots were disallowed by the courts on spurious technical excuses; on each occasion the union doffed its cap and submitted, leaving its members scratching their heads. Doubtless the same farce would have been repeated yet again in December, were it not for the fact that the bourgeois courts themselves felt obliged to turn down GTR’s ludicrous plea that a strike would constitute an infringement of EU freedom of movement laws! Presumably their collective lordships feared that siding with GTR on this occasion risked bringing the law into disrepute. So finally the drivers, having first expressed a clear wish to withdraw their labour back in the spring, were at last permitted the following winter to exercise their right to strike. This they did, and despite the lack of any open coordination it should be acknowledged that ASLEF’s strikes over December and January had the effect of reinforcing the RMT’s efforts, giving a frustrating glimpse of what could be achieved were all rail workers mobilised in industry-wide in class struggle. At this vital moment, in January the TUC stepped into the breach, brokering talks between GTR and ASLEF – talks from which the RMT was excluded. Worse, whilst the talks were ongoing, GTR put pressure on guards who had been forcibly rebranded as watered-down ‘on board supervisors’ to renounce their guard’s safety licence forthwith. As the RMT’s Mick Cash observed, “Now, right in the middle of those talks, Southern are stripping OBS’s of their safety accreditation in a spiteful act designed to undermine and humiliate RMT members while shoving two fingers up at the TUC discussions and everyone engaged in them” (RMT press statement, 31 January 2017). It soon became clear that the job of the TUC, rather than mobilising workers to come out in solidarity with both the guards and the drivers, was to persuade ASLEF to conclude a separate peace with GTR and to hell with the RMT. By so doing it reconfirmed its real role: gendarme of the bourgeoisie in the labour movement. The risible ‘concessions’ from GTR were not worth the paper they were written on. The ‘pledge’ to keep some kind of staff member on board in addition to the driver left the path clear to the continued deskilling of guards, and in any case did not apply in “exceptional circumstances”, to be determined by management. Another ‘pledge’ to replace ropy CCTV cameras only tinkered around the edges of the main dispute. Mick Cash was forthright in his condemnation. Noting that passengers and staff have been “sold out by a stitch-up cooked up…by the TUC”, he added “This is not a deal; it is a disgrace, and the RMT dispute remains on, and we will fight this shocking betrayal with every tool at our disposal” (Mark Hookham and Jonathan Leake, ‘Drivers’ revolt over lost wages forces union to end Southern stand-off’, Sunday Times, 5 February 2017). The RMT is exceptional on the British trade union scene for its courage and militancy, all of which will be required in good measure as we move forward. The working class will indeed need to fight with every tool at its disposal in the revolutionary period ahead. On 1 March the latest Trade Union Act comes into force, strewing yet more obstacles on the path of workers thinking of exercising their right to strike. An RMT motion passed at the last TUC Congress called on the General Council “to convene an urgent conference of affiliates to provide a practical forum, including workshops [! ], as to how best co-ordinate our legal and industrial response to the Act in line with policy already set by Congress.” Whilst such a motion perhaps helps to expose in practice the do-nothing class treachery of the TUC, the RMT has in recent weeks had better cause than most to understand the complete futility of asking that august body to do anything that might be construed as furthering the cause of organised labour in its struggle against capitalism. Drivers on Southern have now delivered a magnificent rebuff to the derisory compromise offer from Govia ThamesLink, voting 54% against 46% on a 72% turnout to reject the ‘deal’ and opening the way to renewed industrial action. Their courageous stand puts to shame the spinelessness of the ASLEF leadership and represents a devastating vote of no confidence in it. A chastened Mick Whelan, ASLEF general secretary, announced that “We understand and support the decision arrived at democratically by our members and will now work to deliver a resolution in line with their expectations.” The RMT, which had correctly denounced ASLEF’s capitulation as a betrayal, called the guards out on Southern again on 22 February. Guards are also being balloted for strikes on the Northern network, where plans are afoot to start DOO from 2018, to be followed by Merseyrail in 2020.